The International Space Station’s robotic duo was in action throughout Wednesday night and on Thursday to pre-position a critical docking adapter to be installed during a spacewalk on Friday to give ISS a new parking spot to be utilized by Commercial Crew vehicles docking at the orbiting outpost. 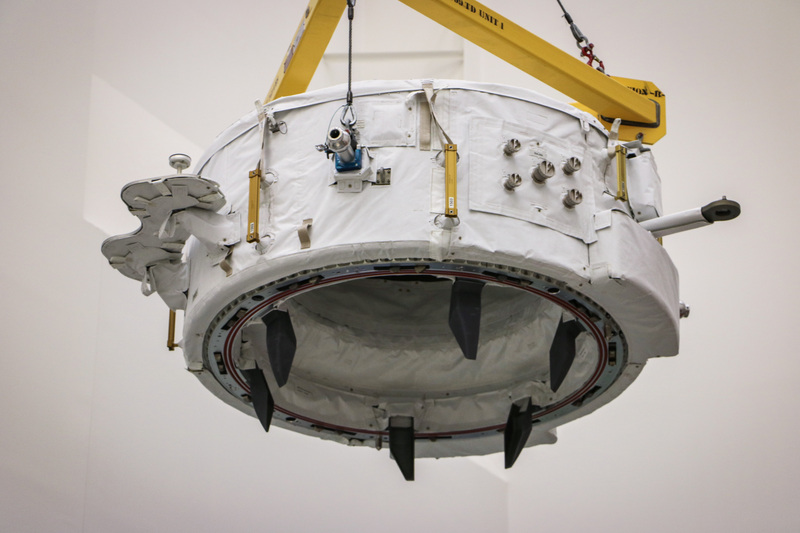 The installation of the International Docking Adapters is a requirement prior to the start of Commercial Crew to convert the APAS-95 docking system to the International Docking Standard used by both Boeing’s CST-100 Starliner and SpaceX’s Dragon 2 spacecraft. The standard may be used by any government and private entity who wish to do so as all technical information is available freely on the web. International Docking Adapter 2 (IDA-2) lifted off aboard the Dragon SpX-9 spacecraft on July 18 and had a smooth two-day ride to the Space Station along with 1,790 Kilograms of cargo stowed inside the pressurized logistics carrier. Due to the loss of the first IDA in the SpX-7 launch failure in June 2015, there was quite some pressure on IDA-2 making it to ISS to establish at least one commercial docking port to avoid a slip in the Commercial Crew timeline. IDA-3 is currently under construction as a replacement for IDA-1 and will head to ISS in late 2017 or early 2018. IDA-2 is to be installed on Pressurized Mating Adapter 2 on the forward end of the Station that supported 35 Space Shuttle visits including the final flight of the program in 2011 while the other IDA will take a position on PMA-3 which is still to be moved from the Node 3 module to the space-facing port on Node 2. The installation of the docking adapters required extensive preparations, both inside and outside ISS via a series of spacewalks performed in 2015 that pre-staged over a dozen cables. These cables were routed from power and data interfaces on the Destiny Lab forward where they were stowed at the IDA installation locations to be ready for the actual installation of the adapters, connecting them to various power and data circuits. The installation of IDA-2 is completed in a two-step processes – the first handled by the Station’s robotic arm and Dextre robot extracting the adapter from Dragon’s trunk section and moving it over to PMA-2 for the second part, the actual installation, to be handled by Jeff Williams and Kate Rubins during a spacewalk on Friday. Robotics picked up just after 22:30 UTC on Wednesday after the crew’s sleep period got underway to avoid robotics impacting crew operations through exercise constraints during the day. 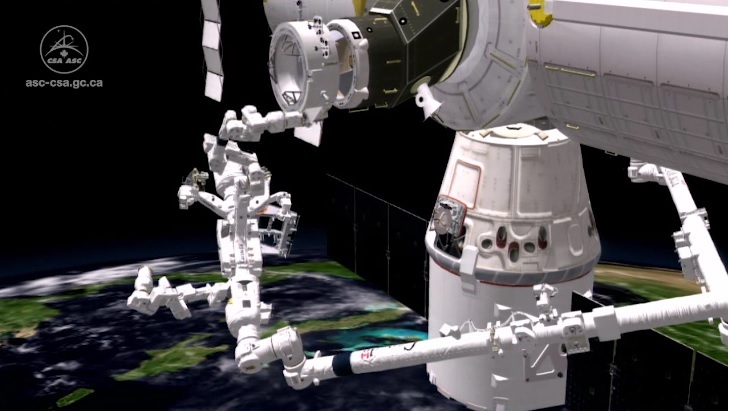 Canadarm2 had picked up the Dextre robot on Tuesday and moved it into the Trunk Section of the Dragon spacecraft where ROBO controllers aligned Dextre’s grapple fixture with the H-Fixture on the IDA for the grapple. 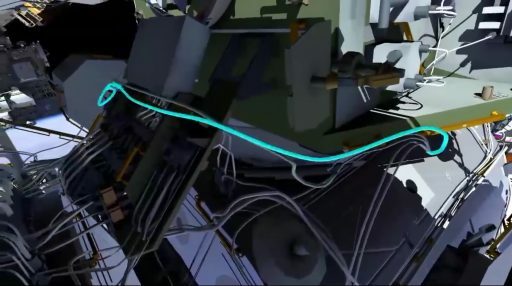 After Dextre had obtained a firm grip of the adapter, the disconnection of heater power umbilicals was commanded followed by the opening of launch locks, documented by cameras inside Dragon’s trunk and on Canadarm2. 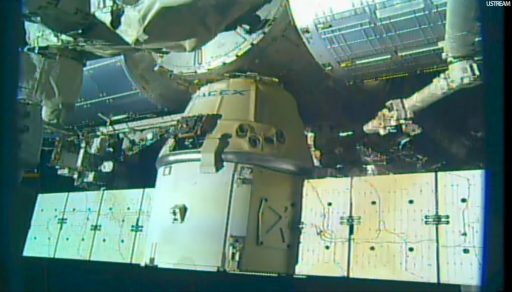 Initial motion was seen as Dextre and Canadarm2 began to slowly pull IDA-2 from Dragon’s trunk, but movement stopped after only a few centimeters of progress. ROBO controllers faced some trouble when a tethered latch bolt became snagged on an IDA hand rail. When the bolt disengaged, its tether got caught on Handrail 1505 creating a potentially harmful situation for the IDA when being moved. ROBO teams very carefully worked out arm motions to wiggle the IDA very deliberately and free up the stuck tether, a process that added around three and a half hours to the extraction of the adapter. Once the tether was free, the speed of Dextre and arm motion increased visibly and IDA-2 was removed from the trunk within a period of minutes. As soon as IDA-2 was clear, it was re-oriented and Canadarm2 started a large maneuver to move outboard in order to get clear of Dragon’s solar array and then swing around to the forward direction with cameras in use to monitor the clearance between the arm and the solar array. The maneuver was completed as planned and a video survey was completed of the underside of the IDA as well as the PMA to ensure all latches and seals were in the expected condition. Once directly in front of the PMA, IDA-2 was properly aligned at a standoff of around half a meter, marking the end of the planned robotic operation. IDA-2 will remain in this position until Friday morning, shortly before the start of the day’s spacewalk when ROBO controllers will slowly push the adapter in, aiming to put it in contact with PMA-2 at the proper alignment to IDA and APAS latches. In their Daily Planning Conference, the ISS crew was informed that IDA-2 had reached the correct configuration for the start of Friday’s installation operation. Picking up where Canadarm2 left off, Williams and Rubins will be tasked with structurally attaching the IDA to PMA-2 followed by the connection of heater and data cables. The two spacewalkers have prepared their space suits over the past three weeks and they have their final procedure reviews and tagup with specialists on the ground later on Thursday to gear up for Friday’s excursion. Per the current plan, the EV crew members are expected out the hatch of the Quest airlock at 12:05 UTC. 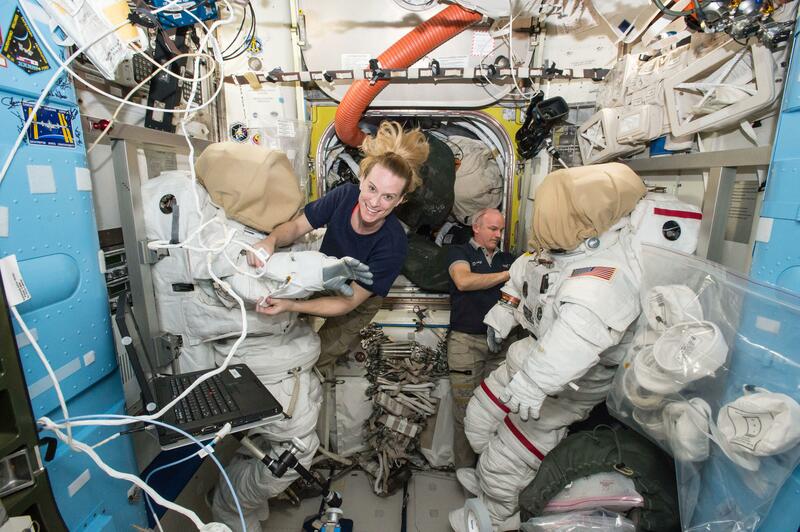 Starting out early on Friday, Williams and Rubins will enter the Equipment Lock of the Quest Airlock together with Takuya Onishi who will assist them with getting into their suits. As part of the pre-breathe protocol, the pressure inside Quest will be reduced to begin purging the spacewalker’s blood – removing nitrogen to avoid them suffering from decompression sickness. Once both spacewalkers have ingressed their EMUs, the airlock can be re-opened and the crew will press into a 100-minute pre-breathe that features blocks of light exercise to accelerate their metabolic rates and help in the removal of nitrogen from the blood. The EV crew members will receive their tools and the CO2 scrubbers on the suits will be replaced before the spacewalkers head into the smaller Crew Lock portion of Quest where they will be sealed off for depressurization. 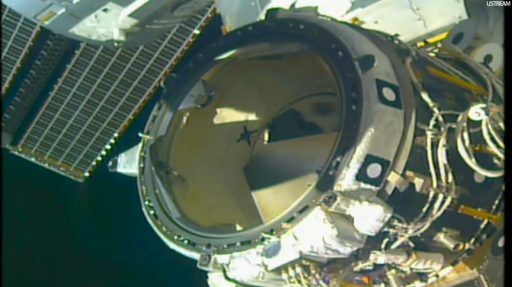 After the completion of leak checks, the airlock will be taken down to the vacuum of space to enable the crew to open up the hatch. Williams, a veteran of three prior EVAs, will be first to egress, wearing the suit with red stripes. He will receive an ORU Bag from Rubins before she also makes her way outside for the usual checks of the crew’s space suits before pressing into the actual EVA timeline. Rubins, wearing an all white suit, will complete a ten-minute translation adaptation in place for every first-time spacewalker to get a feel for the space suit in the vacuum of space as opposed to the water inside the NBL where she completed her training. Next for both crew members is a translation all the way to the front of the Space Station where PMA-2 resides. 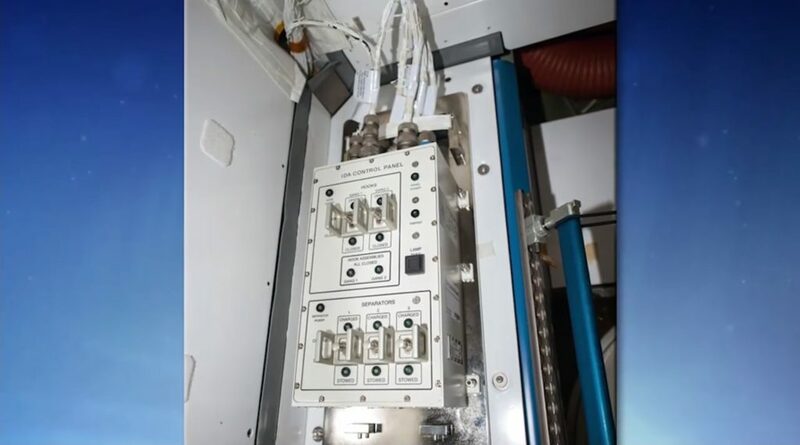 At the PMA, Williams will stow the ORU Bag on the zenith side before retrieving a Articulating Portable Foot Restraint from the Columbus module to be installed in a Worksite Interface on the zenith side of the PMA. Rubins will place her foot restraint in the nadir side of the PMA. With both crew members in position, the next step is the installation of Adjustable Equipment Tethers between the PMA and IDA to secure the adapter in place. 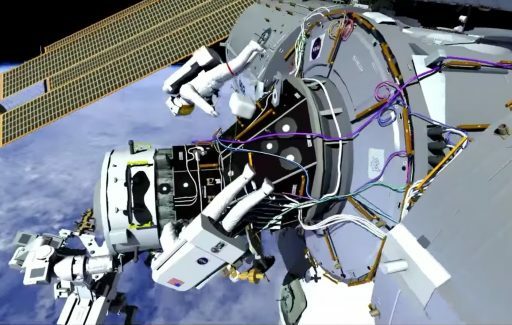 In case IDA-2 can not be positioned properly by the Station’s robotic duo, Williams and Rubins would manually guide it in place after release from Dextre. 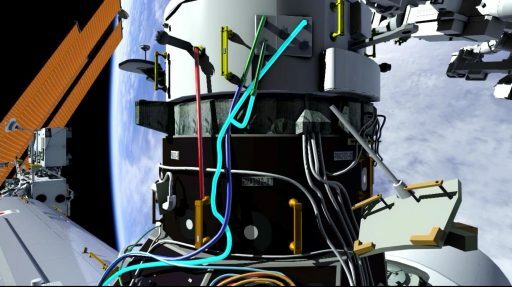 Once Dextre releases the adapter and is clear, the tethers will be tightened and the crew members can get to work with the tedious task of plugging the color-coded cables stowed on the forward end of PMA-2 into their respective sockets on the IDA. Rubins has to connect four cables while Williams has three to deliver heater power, hook drive power and sensor power to the IDA. A GO will then be given to Takuya Onishi to command the IDA via a control panel inside the Destiny Lab which interfaces with the cables mated to the adapter by the spacewalking duo. This will command a first set of hooks to close and structurally mate the IDA to the PMA, tightly pulling the two together and forming a tight seal. A second set of hooks will be driven as the crew moves on to their next tasks. Williams and Rubins will cover up a pair of hemispherical reflectors on PMA-2 that were used by the Shuttle’s Proximity Navigation System and are replaced by two reflectors on IDA-2. To avoid reflections from the old ones confusing approaching spacecraft, they are simply covered up with a non-reflective cover bag. Finally, the spacewalkers will remove the power from the hook drives once IDA is fully installed and place the power connectors to interfaces that deliver power to the visiting vehicle hooks before also installing the ISS-to-VV power supply. 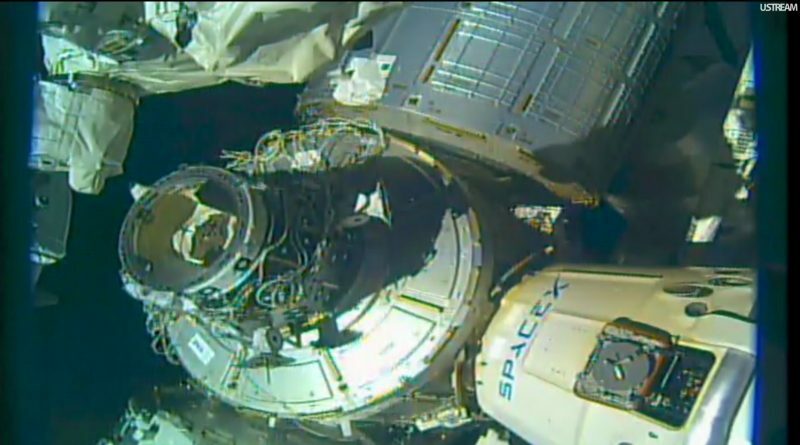 To clean up at IDA-2, the spacewalkers will remove the H-Fixture that was used by Dextre and take off a protective cover from the passive NASA Docking System on the front of IDA-2. Before departing the work site, the crew will place the two new hemispherical reflectors on IDA-2 to provide guidance for future approaching vehicles. 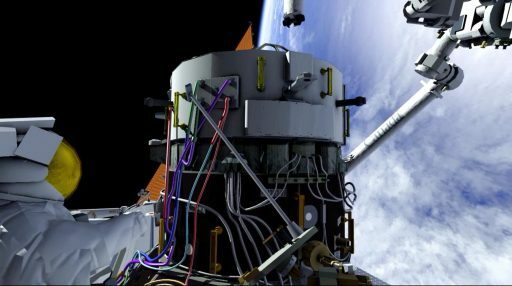 Leaving IDA-2, Rubins will return her foot restraint to External Stowage Platform 2 while Williams will position his APFR on Node 2 to be ready for the installation of IDA-3 in late 2017 or early 2018. 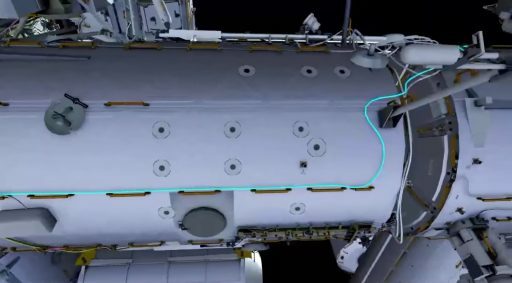 He will then return the ORU bag and make his way to what is known as the ‘Rats Nest’ – the area where the Lab, Node 1 and the Z1 truss intersect and a large amount of lines and cables are mounted. 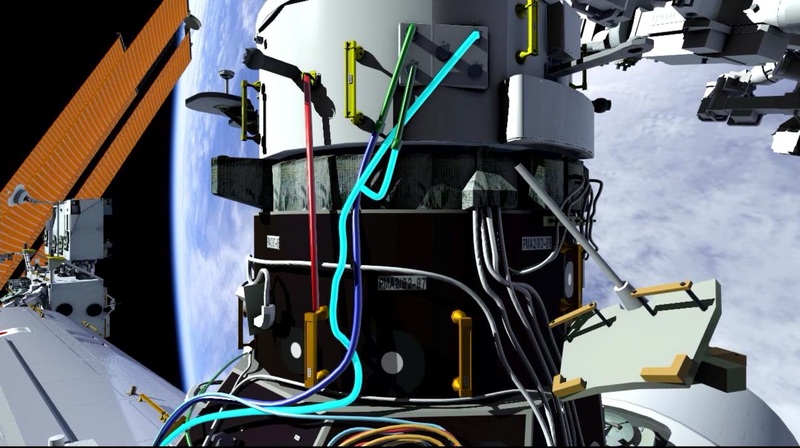 Picking up a cable bundle, Williams will make a series of connections on Node 2 and route the cables around the Z1 tray to a temp-stowage location on the starboard side for a future EVA. 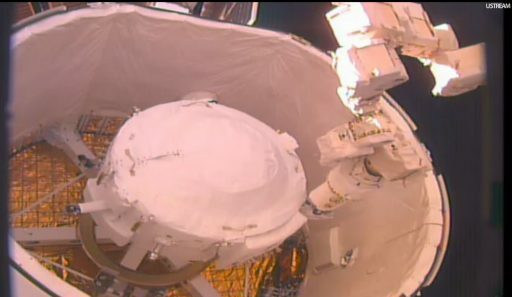 His last task will be the removal of a pair of connector caps just below Z1 to be ready for connections made in a future EVA. Kate Rubins will end her first EVA by moving over to the Destiny Lab’s nadir side, retrieving a green-white cable and routing it forward to Node 2 zenith where it will be placed for eventual attachment to IDA-3. Based on the progress of tasks, the crew may perform up to two get ahead tasks – a brief reconfiguration of the Port CETA Cart by tying down brake handles, and the collection of engineering photos of the Alpha Magnetic Spectrometer’s outboard side that can not be surveyed by ISS video cameras. Returning to the airlock, the crew will repeat their suit checks and make a tool inventory before climbing back inside and closing the hatch to set up for repressurization after what is likely to be a lengthy spacewalk. Recently, Williams and Rubins had an additional EVA added to their flight plan by ISS Mission Managers taking advantage of a gap created by the delays of the Cygnus OA-5 and HTV-6 cargo flights. 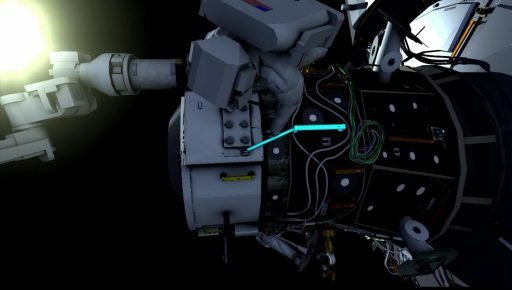 This EVA, currently on the schedule for September 1, will be dedicated to the retraction of the Trailing Thermal Control Radiator out on the P6 truss – a task that failed in a November spacewalk by Kjell Lindgren and Scott Kelly.